It's official – I have begun my first major foray into wildcrafting. After spending a morning with Earthheart, I came home with an abundance of St. John's wort, mullein, and red clover from her Mullein mania patch. So – what to do with the haul? Let's start with mullein AKA “Great Mullein, Aaron's Rod, candlewick plant, flannel plant, lungwort, shepherd's staff, velvet dock and torches”. o The saponins contained in the herb help to loosen and remove mucus from the lungs, while the mucilage soothes the mucus membranes and the iridoid glycosides help to fight inflammation. o Internally, it is used for coughs, whooping cough, bronchitis, laryngitis, tonsillitis, tracheitis, asthma, influenza, tuberculosis, urinary tract infections, nervous tension, and insomnia. o Although it is particularly effective to loosen mucus in the lungs it also shows some success with reducing water retention. o Historically it was also used for genito-urinary tract infections. o Externally, mullein is used to treat earache, specifically chronic otitis media (the flowers are macerated in olive oil), sores, eczema (especially around the ear), wounds, boils, rheumatic pain, hemorrhoids and chilblains. On the the St. John's wort. o St. John's Wort is used internally for anxiety, mild to moderate depression, nervous tension, insomnia, menopausal disturbances, premenstrual syndrome, shingles, sciatica and fibrositis. o It is also used to treat inflammation of the stomach and intestines and against internal worms. o Not to be taken by people suffering from severe depression. o It is also used in homeopathy for pain relief and to combat inflammation caused by nerve damage. o It is used locally for its anti-septic and analgesic effect on burns, bruises, sores and deep wounds with nerve damage, as well as sprains, tennis elbow and cramps. o A macerated oil is normally made by steeping the dried material in a carrier oil such as wheatgerm or olive oil, and this macerated oil is then used to treat wounds and burns. Finally, the red clover (from herbwisdom.com). Hot flashes/flushes, PMS, Lowers cholesterol, helps prevent osteoporosis, reduces possibility of forming blood clots and arterial plaques, can limit development of benign prostate hyperplasia. Breast enhancement and breast health. Improve urine production, circulation of the blood and secretion of bile. They also act as detergent, sedative and tonic. Red clover has the ability to loosen phlegm and calm bronchial spasms. The fluid extract of red clover is used as an antispasmodic and alterative. I split the mullein and St.John's wort flowers about 50/50 – half went into the dryer and half went into an oil infusion. 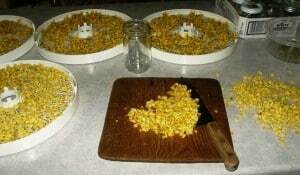 The mullein flowers looked very much like buttery popcorn as I loaded them in the dehydrator. I'm so glad I purchased the extra inserts for fine or sticky materials. Without them the flowers would fall right through the racks as they dry. I used a big ole knife to mince up the flowers before they went into old coconut oil jars (reduce, reuse, recycle). 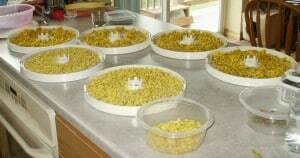 They are then covered with olive oil. This infusion is then covered, LABELED (it's amazing how all the jars start to look alike after brewing a while, not to mention keeping track of the dates so you know when they are done) and placed in a sunny area and stirred or shaken several times a day for a 2-6 weeks. Sunlight encourages the release of the plant oils. At the end of infusions time, the oil is strained through a cheesecloth and placed in a dark, sealed container. It can be used “as is” or made into a salve alone or with other oils. I dried all of the clover. Every reference I found seemed to focus on taking it internally as a tea (preferably fresh, but dried will do when fresh is not available). I now have about a quart of clover blossoms (stored in a jar from grape jelly). I also put some clary sage flowers to infuse in some coconut oil. I like using coconut oil as a general skin softener and clary sage is supposed to be relaxing, so hopefully this will be a good combo. I only made a small amount this time around to give it a try. It is amazingly fragrant, and quite pleasant. BTW, the clary sage is from my garden, not wildcrafted. I removed all seed heads from the plants and will likely burn them, as the plant has been known to become invasive. I planted it once several years ago and it has self-sown around the garden since that time (the flowers don't all mature at the same time, so even though I did cut off the seed heads, some seeds escaped). Once the rains stop (we've just received more rain this weekend than we have all summer), I plan to harvest yarrow, dill, hyssop, some more chamomile, lemon balm, borage – the garden is in full bloom. Nettle, plantain and tansy are on the list, too. I've been inspired by Handmaiden's Kitchen and EarthHeart, among other things. I'm very concerned about the whole government health care situation, and have had the feeling for some time now that I need to learn as much as possible about natural healing alternatives. I'm finding I have less and less faith in Big Pharma and the health care status quo, especially as I see their continued lack of solutions for the health problems of my aging loved ones. It seems that the only solution is more pills, more pills, more pills. Have you looked at the lists of possible side effects on most medications lately? Yes, herbs have side effects, too, and should never be used carelessly, but used wisely I believe they offer a safer, gentler alternative. I want to take a proactive approach to my family's health, not a reactive one. Featured at Wildcrafting Wednesday #7. Hey CM – the St. John's wort business is a bust for this year. I didn't dry my stash enough and has turned furry and had to be tossed. At least my oil infusion is still okay. So much to learn, so little time! Now everything get dried to "extra crunchy" (which you should appreciate ;-). I'm learning more all the time. I like Crunchy Momma's idea for the "crabby spray". I've added you to my blog roll. There's a lot to learn here, and I hope folks wander over. I’m always looking for ways to use natural remedies and herbs over “conventional” drugs so this is right up my alley. Thanks, Becca. I’ll be starting up the Weekly Weeder come spring, so make sure to stop back to learn more about common weeds and their uses. Is there a book you would recommend about wildcrafting? Just a heads up on St. John’s Wort, if you take it too late in the day, it will disrupt your sleep with long tiring dreams! I try to avoid drinking the tea anytime after 2:00 in the afternoon. How do you get rid of the little black bugs that are all over the mullein flowers please? They are so tiny they look like splinters. I picked some flowers and laid them out to dry but the bugs stayed on them. Tried picking them off or rubbing them off but again they are so small they are hard to get. Once the flower dries do they die or give up and go away? lol Thank you! I’m not sure which bugs you are talking about, as my mullein don’t seem to have them. 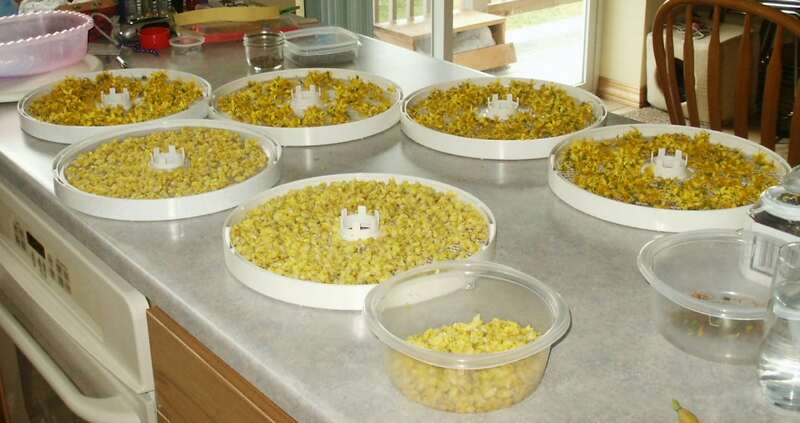 You could try soaking the flowers, then running them through a salad spinner before drying. I have a question. My new Presto Dehydro owners manual doesn’t recommend drying aromatic herbs, such as basil & oregano. Guess what I was planning to try! You got it-basil & oregano from my garden. Do you know if this is an overall issue with the herb, or could it be a model-specific thing? Thanks in advance. Hmmm… that’s a new one on me. Maybe they’re concerned with the dehydrator picking up the odor from the herbs? 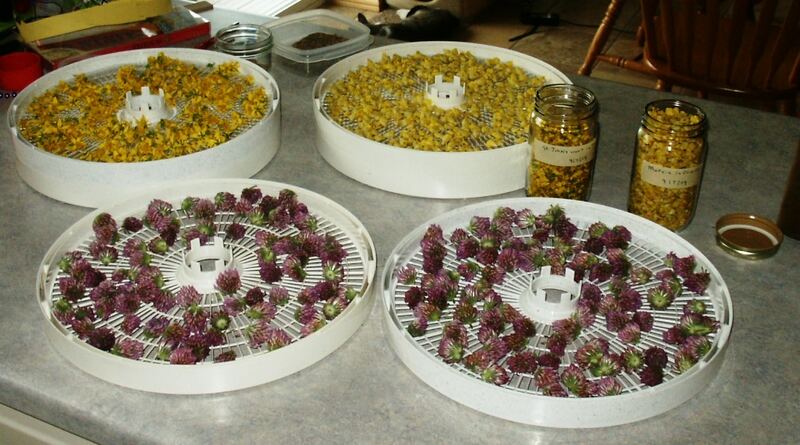 I’ve had no trouble with drying all sorts of herbs in mine. The only issue I have had is when I didn’t strip herbs off the stem, and the stem stayed damp, or with clover buds that I thought were dry, but were still damp inside.